Note: This story appeared in Volume 8, Number 2 of Meadowlark, A Journal of Illinois Birds, the quarterly journal of the Illinois Ornithological Society. On November 10 and 11, 1998, an intense low pressure system passed through the upper Midwest, accompanied by gale force winds. The forecast for November 11 positioned the center of this storm just north of Lake Superior. Because air moves counterclockwise around a low, the wind that day would be from the west in the Chicago area, ideal conditions for a late fall hawk flight. The temptation was too great to resist so I decided to spend the day at Illinois Beach State Park (hereafter I.B.S.P.) in Lake County, the premier location in Illinois for observing migrating fall raptors. I arrived at I.B.S.P. at 7:30 a.m. and set up near the mouth of the Dead River, the traditional spot for hawk watching at the park. Almost immediately I began to notice hundreds of migrating waterfowl, which upon closer scrutiny proved to be mostly Mallards. Flocks were visible in every direction and as far as optical performance would permit. Within an hour or two, groups of Snow and White-fronted Geese began to appear, the later species unusual along Lake Michigan. These birds were responding to the extreme weather by moving south en masse. Sandhill Cranes were also starting to appear, and by late morning hundreds were in the sky at the same time. At noon I considered leaving for a brief lunch break, for although the cranes and waterfowl were enjoyable, the hawk flight I had envisioned was not materializing. Bob Ericson, an I.B.S.P. regular visitor, arrived about an hour earlier and joined me; fearful of missing something, I decided to forgo lunch. About 12:45, I noticed a large white bird coming in from the northwest, somewhat isolated from a group of nearby Sandhills. The split second between seeing the bird and raising my binoculars I thought it would turn out to be an American White Pelican. Through binoculars however it was obviously a Whooping Crane (Grus americana) and I yelled this fact with such volume the bird itself probably heard me. The crane flew almost directly overhead at no more than 150 feet and at a slow enough pace to be photographed*. The black primaries, long legs and neck, and red crown were all visible. My initial excitement was tempered by the seeming impossibility of what just happened - Whooping Cranes should not occur anywhere near Illinois, so I rationalized the bird must have been an escape or waif from a reintroduction program. In retrospect it became apparent that this was indeed a wild bird, a product of the intense storm and attendant high winds that battered the Midwest on November 10 and 11. 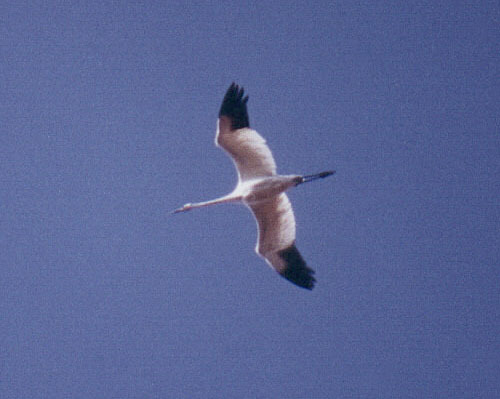 This crane had literally been blown off course from its normal migration route through central Canada the Dakotas. Although there are a few recent records of this species from Illinois, the only other confirmed 20th century sighting is the adult bird documented in Pike County in 1958. Not surprisingly, other extralimital Whooping Cranes were reported from several states adjacent to Illinois on or around November 11. As far as I know none of these birds were photographed but are probably correct given the I.B.S.P. sighting and the circumstances surrounding its appearance. The entire wild population of Whooping Cranes was down to about 20 individuals in 1941. Thanks to conservation efforts and a reintroduction program, the wild population as of 2016 is now over 400 birds. What is the future of this species in Illinois? Although Whooping Cranes may once have nested here, the chances that they will ever do so again are nil; their preferred habitat of undisturbed prairie wetland was eliminated long ago. Also, the Whooping Cranes that once regularly migrated through our state came from populations that were extirpated. There is talk of introducing a population somewhere in the Upper Peninsula of Michigan or possibly Wisconsin. Once established, these birds would almost certainly pass through Illinois on migration. Otherwise, given the high fidelity of the Wood Buffalo National Park** flock to a narrow migration corridor through the center of the country, an extraordinary weather event (as occurred on November 10 and 11) at the right time of year (mid-October to mid-November) probably represents the only hope of seeing this endangered species in Illinois again. *I used a Nikon FT2 camera with a 400mm telephoto lens to photograph this bird. **A 44, 807 square km park in northwestern Canada, the only place where wild Whooping Cranes nest anymore. Addendum: A Whooping Crane reintroduction program began in the fall of 2001. The goal of this effort is to establish a migratory flock of Whooping Cranes that summers (and hopefully breeds) in Wisconsin and winters in Florida.